OK Go is a visual feast. Berger’s signature style of cut paper collages has been masterfully put together to deliver a hopeful message about slowing down to take care of our Earth. The characters are unique, yet familiar, and detailed-to-boot using magazine clippings, buttons, fabrics, and many, many more recycled materials. Combined with simple text, in fact hardly any words at all, the pages become progressively filled with chaotic images of automobiles that are filling the sky with pollution, until one guy yells, “STOP!” The automobiles come to a screeching halt as the characters come up with ideas on improving their situation. A beautiful fold-out-spread reveals many “green” ideas using zany and creative characters, such as: Roller Skate, Kate; Use It Again, Jen; and Keep It Clean, Gene. An energetic book with creative flair is a contemporary way to encourage kids (and parents) to “go green”! Publisher’s synopsis: In a world of go! go! go! go! go! it’s time to stop! and find a new way. Carin Berger’s playful new picture book is a jubilant celebration of going green. About Carin Berger: Carin Berger is an award-winning designer and illustrator. She is the author and illustrator of The Little Yellow Leaf, Not So True Stories & Unreasonable Rhymes, and All Mixed Up: A Mix-and-Match Book, and the illustrator of Behold the Bold Umbrellaphant, by Jack Prelutsky. 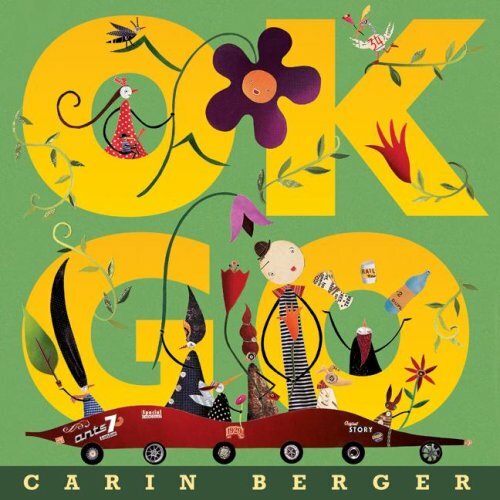 She won the Society of Illustrators Founder’s Award in 2006, and Publishers Weekly called her “one to watch.” Carin Berger lives with her family in New York City. You may also enjoy some of Carin Berger’s other books, like: The Little Yellow Leaf.